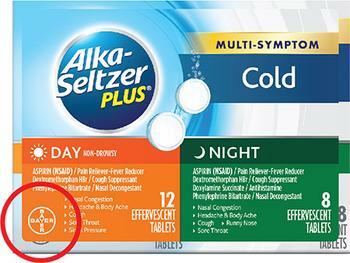 Bayer is recalling Alka-Seltzer Plus packages sold only in the U.S. at Walmart, CVS, Walgreens and Kroger (including Dillons Food Stores, Fred Meyer, Fry’s Food Stores, Ralphs, King Soopers and Smith’s Food and Drug) after February 9, 2018. The ingredients listed on the front sticker of the carton may be different from the ingredients listed on the back of the carton, leading consumers to ingest a product to which they may have an allergy or anaphylactic reaction. In addition, the product may contain an ingredient which may be contraindicated for their medical condition or they intend to otherwise avoid, with the potential for serious health consequences. No complaint has been received to date that resulted in an adverse health consequence. The recalled product can be identified by checking the Bayer logo located on the lower left corner of the front of the carton. If the logo has an orange or green background, the product is included in the recall. Customers who purchased the recalled product should stop using it t and contact Bayer for instructions about how to receive a refund. Consumers with questions may contact Bayer consumer relations at 1-800-986-0369 Monday – Friday 9:00 AM – 5:00 PM (ET).